We recommend a range of circular routes along surfaced forest roads for cyclists who really want to get to know the countryside and do not mind sloping terrain. The routes will take you to the very easternmost tip of the Czech Republic - Trojmezí - a place where three countries meet. It might be interesting, that the route goes trough a piece of Poland, where the terrain is easier. 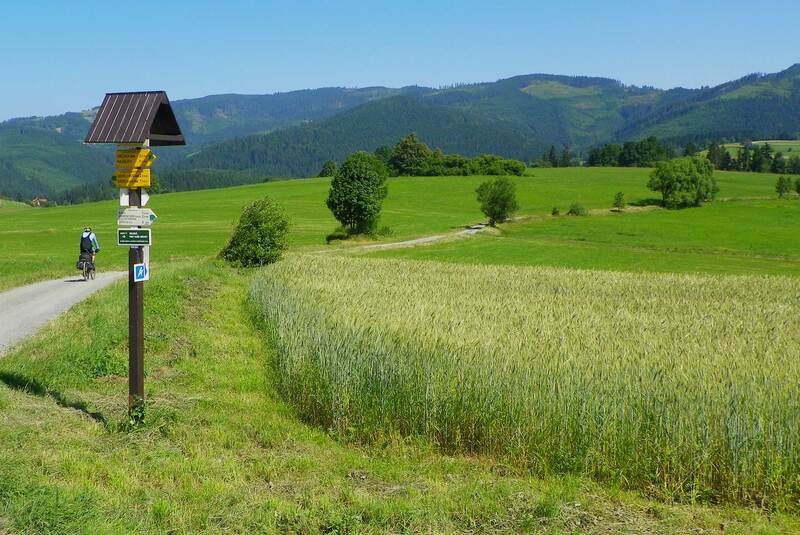 Another route will lead you right up to the summit of Javorový mountain - but don't worry, you can take your bike up by a chair lift and enjoy the downward run on a good quality forest road. We recommend that you follow the suggested direction on these circular routes - they are planned so that the ascents are more gradual and more difficult sections with poorer-quality surfaces can be passed without pedaling. Jablunkov - Pod Zelenou - Studeničné - Hrčava – Jaworzynka (Poland) – Trojmezí (from Polish side) – Jaworzynka (border crossing) - Bukovec - Písek - Jablunkov. You can cycle to Trojmezí directly if you follow yellow signs but it is a rapid and unpleasant downward run on the road created from packs!